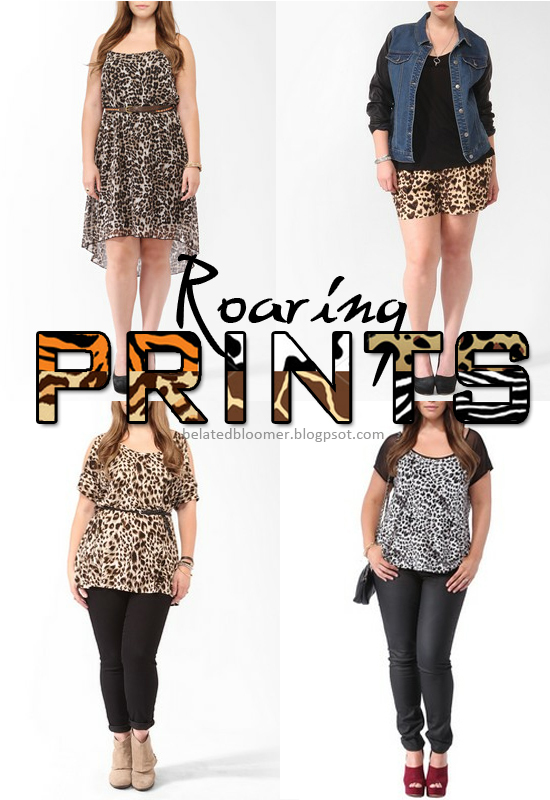 Lately, I've been seeing an influx of different animal prints in stores and on everyone else, so I thought of making this collage of animal-print items as an outfit inspiration/guide for plus-sized / curvy ladies everywhere. The photos I picked for the collage are chic examples of wearing the trend and still looking classy, because I've noticed that the problem with animal prints is that one can easily go overboard and look tacky. A good tip to avoid looking like an actual feline or other four-legged creatures would be to choose one print and make it a key piece in your outfit. Or if you have enough fashion guts, you could mix animal prints (like leopard or cheetah) and make it work. Just make sure the color palettes are similar and the prints aren't too loud. Here's my attempt at the trend by wearing a zebra-inspired batwing top from the previous post. Which one's your favorite? PS: All the outfit photos from Forever 21 site, by the way. I just hope the local merchandisers of F21 Philippines also bring in all these items here! Love the leopard shorts - so cute! weew! i love this blog! am a plus size girly too but no one can stop me from dressing up! hhoooooray!!!! am a new follower here.. hope you can drop by my blog and follow me too gorgeous! love animal print pieces if worn in moderation! nice blog you have here!